We normally have stock of houses, runs, flexible fencing and run covers - please call to reserve before travelling as we have limited numbers. If you would like to view any of the Omlet products please feel free to come and see ours at home being used. I can then run through all the features and benefits of the Omlet products with you. 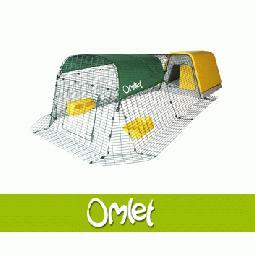 In our boarding fields we use the Omlet Cube /Omlet Go / Omlet Go Up and Omlet Classichouses. 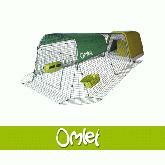 Omlet houses are extremely easy to clean and are maintainance free - they really make keeping poultry childs play. For more details of all the Omlet Eglu products please visit the omlet site direct. Unfortunately due to postage charges we are unable to sell the Omlet Cube Housing - but we still recommend it! If interested please visit the Omlet Website by clicking the link below.